This article is about an astronomical event. For the celestial coordinates, see Equinox (celestial coordinates). For the article about a specific equinox, see March equinox and September equinox. For other uses, see Equinox (disambiguation). Not to be confused with solstice. The Sun at the moment of the spring equinox in 2019, when the Sun crossed the celestial equator – the imaginary line in the sky above the Earth's equator – from south to north. In the northern hemisphere, the equinox in March is called the Vernal or Spring Equinox; the September equinox is called the Autumnal or Fall Equinox. The dates are slightly variable, dependent as they are on the leap year cycle. Because the Moon (and to a lesser extent the planets) cause the motion of the Earth to vary from a perfect ellipse, the equinox is now officially defined by the Sun's more regular ecliptic longitude rather than by its declination. The instants of the equinoxes are currently defined to be when the longitude of the Sun is 0° and 180°. Systematically observing the sunrise, people discovered that it occurs between two extreme locations at the horizon and eventually noted the midpoint between the two. Later it was realized that this happens on a day when the durations of the day and the night are practically equal and the word "equinox" comes from Latin Aequus, meaning "equal", and Nox, meaning "night". In the northern hemisphere, the vernal equinox (March) conventionally marks the beginning of spring in most cultures and is considered the start of the New Year in the Assyrian calendar, Hindu and the Persian calendar or Iranian calendars as Nowruz (means new day), while the autumnal equinox (September) marks the beginning of autumn. The relation between the Earth, Sun, and stars at the March equinox. From Earth's perspective, the Sun appears to move along the ecliptic (red), which is tilted compared to the celestial equator (white). Diagram of the Earth's seasons as seen from the north. Far right: December solstice. Diagram of the Earth's seasons as seen from the south. Far left: June solstice. 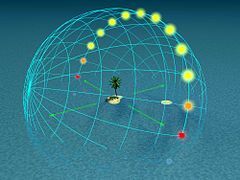 The equinoxes are the only times when the solar terminator (the "edge" between night and day) is perpendicular to the equator. As a result, the northern and southern hemispheres are equally illuminated. When Julius Caesar established the Julian calendar in 45 BC, he set 25 March as the date of the spring equinox; this was already the starting day of the year in the Persian and Indian calendars. Because the Julian year is longer than the tropical year by about 11.3 minutes on average (or 1 day in 128 years), the calendar "drifted" with respect to the two equinoxes – so that in AD 300 the spring equinox occurred on about 21 March, and by AD 1500 it had drifted backwards to 11 March. This drift induced Pope Gregory XIII to create the modern Gregorian calendar. The Pope wanted to continue to conform with the edicts of the Council of Nicaea in AD 325 concerning the date of Easter, which means he wanted to move the vernal equinox to the date on which it fell at that time (21 March is the day allocated to it in the Easter table of the Julian calendar), and to maintain it at around that date in the future, which he achieved by reducing the number of leap years from 100 to 97 every 400 years. However, there remained a small residual variation in the date and time of the vernal equinox of about ±27 hours from its mean position, virtually all because the distribution of 24-hour centurial leap days causes large jumps (see Gregorian calendar leap solstice). This in turn raised the possibility that it could fall on 22 March, and thus Easter Day might theoretically commence before the equinox. The astronomers chose the appropriate number of days to omit so that the equinox would swing from 19 to 21 March but never fall on 22 March (within Europe). The dates of the equinoxes change progressively during the leap-year cycle, because the Gregorian calendar year is not commensurate with the period of the Earth's revolution about the Sun. It is only after a complete Gregorian leap-year cycle of 400 years that the seasons commence at approximately the same time. In the 21st century the earliest March equinox will be 19 March 2096, while the latest was 21 March 2003. The earliest September equinox will be 21 September 2096 while the latest was 23 September 2003 (Universal Time). Vernal equinox and autumnal equinox: these classical names are direct derivatives of Latin (ver = spring and autumnus = autumn). 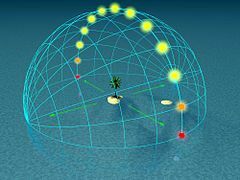 These are the historically universal and still most widely used terms for the equinoxes, but are potentially confusing because in the southern hemisphere the vernal equinox does not occur in spring and the autumnal equinox does not occur in autumn. The equivalent common language English terms spring equinox and autumn (or fall) equinox are even more ambiguous. It has become increasingly common for people to refer to the September equinox in the southern hemisphere as the Vernal equinox. March equinox and September equinox: names referring to the months of the year in which they occur, with no ambiguity as to which hemisphere is the context. They are still not universal, however, as not all cultures use a solar-based calendar where the equinoxes occur every year in the same month (as they do not in the Islamic calendar and Hebrew calendar, for example). Although the terms have become very common in the 21st century, they were sometimes used at least as long ago as the mid-20th century. Northward equinox and southward equinox: names referring to the apparent direction of motion of the Sun. 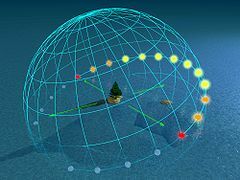 The northward equinox occurs in March when the Sun crosses the equator from south to north, and the southward equinox occurs in September when the Sun crosses the equator from north to south. These terms can be used unambiguously for other planets. They are rarely seen, although were first proposed over 100 years ago. First Point of Aries and first point of Libra: names referring to the astrological signs the Sun is entering. Due to the precession of the equinoxes, however, the constellations where the equinoxes are currently located are Pisces and Virgo, respectively. From the Earth, the Sun appears as a disc rather than a point of light, so when the centre of the Sun is below the horizon, its upper edge may be visible. Sunrise, which begins daytime, occurs when the top of the Sun's disk appears above the eastern horizon. At that instant, the disk's centre is still below the horizon. The Earth's atmosphere refracts sunlight. As a result, an observer sees daylight before the top of the Sun's disk appears above the horizon. In sunrise/sunset tables, the assumed semidiameter (apparent radius) of the Sun is 16 arcminutes and the atmospheric refraction is assumed to be 34 arcminutes. Their combination means that when the upper limb of the Sun is on the visible horizon, its centre is 50 arcminutes below the geometric horizon, which is the intersection with the celestial sphere of a horizontal plane through the eye of the observer. These effects make the day about 14 minutes longer than the night at the equator and longer still towards the poles. The real equality of day and night only happens in places far enough from the equator to have a seasonal difference in day length of at least 7 minutes, actually occurring a few days towards the winter side of each equinox. The times of sunset and sunrise vary with the observer's location (longitude and latitude), so the dates when day and night are equal also depend upon the observer's location. A third correction for the visual observation of a sunrise (or sunset) is the angle between the apparent horizon as seen by an observer and the geometric (or sensible) horizon. This is known as the dip of the horizon and varies from 3 arcminutes for a viewer standing on the sea shore to 160 arcminutes for a mountaineer on Everest. The effect of a larger dip on taller objects (reaching over 2½° of arc on Everest) accounts for the phenomenon of snow on a mountain peak turning gold in the sunlight long before the lower slopes are illuminated. The date on which the day and night are exactly the same is known as an equilux; the neologism, believed to have been coined in the 1980s, achieved more widespread recognition in the 21st century. (Prior to this, the word "equilux" was more commonly used as a synonym for isophot, and there was no generally accepted term for the phenomenon. )[note 1] At the most precise measurements, there is no such thing as an equilux, because the lengths of day and night change more rapidly than any other time of the year around the equinoxes. In the mid-latitudes, daylight increases or decreases by about three minutes per day at the equinoxes, and thus adjacent days and nights only reach within one minute of each other. The date of the closest approximation of the equilux varies slightly by latitude; in the mid-latitudes, it occurs a few days before the spring equinox and after the fall equinox in each respective hemisphere. In the half-year centered on the June solstice, the Sun rises north of east and sets north of west, which means longer days with shorter nights for the northern hemisphere and shorter days with longer nights for the southern hemisphere. 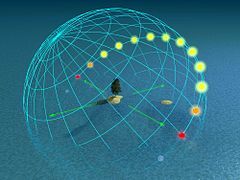 In the half-year centered on the December solstice, the Sun rises south of east and sets south of west and the durations of day and night are reversed. Most places on Earth use a time zone which differs from the local solar time by minutes or even hours. For example, if a location uses a time zone with reference meridian 15° to the east, the Sun will rise around 07:00 on the equinox and set 12 hours later around 19:00. Day length is also affected by the variable orbital speed of the Earth around the Sun. This combined effect is described as the equation of time. Thus even locations which lie on their time zone's reference meridian will not see sunrise and sunset at 6:00 and 18:00. At the March equinox they are 7–8 minutes later, and at the September equinox they are about 7–8 minutes earlier. Sunrise and sunset are commonly defined for the upper limb of the solar disk, rather than its center. The upper limb is already up for at least a minute before the center appears, and the upper limb likewise sets later than the center of the solar disk. Also, when the Sun is near the horizon, atmospheric refraction shifts its apparent position above its true position by a little more than its own diameter. This makes sunrise more than two minutes earlier and sunset an equal amount later. These two effects combine to make the equinox day 12 h 7 min long and the night only 11 h 53 min. Note, however, that these numbers are only true for the tropics. For moderate latitudes, the discrepancy increases (e.g., 12 minutes in London); and closer to the poles it becomes very much larger (in terms of time). Up to about 100 km from either pole, the Sun is up for a full 24 hours on an equinox day. Height of the horizon changes the day's length. For an observer atop a mountain the day is longer, while standing in a valley will shorten the day. The Sun is larger in diameter than the Earth, so more than half of the Earth is in sunlight at any one time (due to unparallel rays creating tangent points beyond an equal-day-night line). Some of the statements above can be made clearer by picturing the day arc (i.e., the path along which the Sun appears to move across the sky). The pictures show this for every hour on equinox day. In addition, some 'ghost' suns are also indicated below the horizon, up to 18° below it; the Sun in such areas still causes twilight. The depictions presented below can be used for both the northern and the southern hemispheres. The observer is understood to be sitting near the tree on the island depicted in the middle of the ocean; the green arrows give cardinal directions. In the northern hemisphere, north is to the left, the Sun rises in the east (far arrow), culminates in the south (right arrow), while moving to the right and setting in the west (near arrow). In the southern hemisphere, south is to the left, the Sun rises in the east (near arrow), culminates in the north (right arrow), while moving to the left and setting in the west (far arrow). The arc passes through the zenith, resulting in almost no shadows at high noon. The Sun culminates at 70° altitude and its path at sunrise and sunset occurs at a steep 70° angle to the horizon. Twilight still lasts about one hour. Twilight lasts almost two hours. The Sun culminates at no more than 20° altitude and its daily path at sunrise and sunset is at a shallow 20° angle to the horizon. Twilight lasts for more than four hours. If it were not for atmospheric refraction, the Sun would be on the horizon all the time. in the equatorial coordinate system, the vernal point is the origin of the right ascension. Diagram illustrating the difference between the Sun's celestial longitude being zero and the Sun's declination being zero. The Sun's celestial latitude never exceeds 1.2 arcseconds, but is exaggerated in this diagram. Strictly speaking, at the equinox, the Sun's ecliptic longitude is zero. Its latitude will not be exactly zero, since Earth is not exactly in the plane of the ecliptic. Its declination will not be exactly zero either. The mean ecliptic is defined by the barycenter of Earth and the Moon combined, so the Earth wanders slightly above and below the ecliptic due to the orbital tilt of the Moon. The modern definition of equinox is the instants when the Sun's apparent geocentric longitude is 0° (northward equinox) or 180° (southward equinox). See the adjacent diagram. Because of the precession of the Earth's axis, the position of the vernal point on the celestial sphere changes over time, and the equatorial and the ecliptic coordinate systems change accordingly. Thus when specifying celestial coordinates for an object, one has to specify at what time the vernal point and the celestial equator are taken. That reference time is called the equinox of date. The upper culmination of the vernal point is considered the start of the sidereal day for the observer. 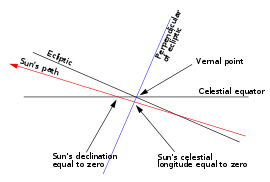 The hour angle of the vernal point is, by definition, the observer's sidereal time. The March equinox passed from Taurus into Aries in year −1865, passed into Pisces in year −67, will pass into Aquarius in year 2597, and then into Capricornus in year 4312. In 1489 it came within 10 arcminutes of Cetus without crossing the boundary. The September equinox passed from Libra into Virgo in year −729, will pass into Leo in year 2439. The equinoxes are sometimes regarded as the start of spring and autumn. A number of traditional harvest festivals are celebrated on the date of the equinoxes. Satellites in geostationary orbit also experience difficulties maintaining power during the equinox, due to the fact that they now have to travel through Earth's shadow and rely only on battery power. Usually, a satellite will travel either above or below the Earth's shadow due to its shifted axis throughout the year; during the equinox, since geostationary satellites are situated above the equator, they will be put into the shadow of the Earth for the longest period of time all year. When the planet Saturn is at equinox, its rings reflect little sunlight, as seen in this image by Cassini in 2009. Equinoxes occur on any planet with a tilted rotational axis. A dramatic example is Saturn, where the equinox places its ring system edge-on facing the Sun. As a result, they are visible only as a thin line when seen from Earth. When seen from above – a view seen during an equinox for the first time from the Cassini space probe in 2009 – they receive very little sunshine, indeed more planetshine than light from the Sun. This phenomenon occurs once every 14.7 years on average, and can last a few weeks before and after the exact equinox. Saturn's most recent equinox was on 11 August 2009, and its next will take place on 6 May 2025. Mars's most recent equinox was on 22 May 2018 (northern autumn), and the next will be on 23 March 2019 (northern spring). ^ This meaning of "equilux" is rather modern (c. 1985 to 1986) and unusual. Technical references since the beginning of the 20th century (c. 1910) use the terms "equilux" and "isophot" to mean "of equal illumination" in the context of curves showing how intensely lighting equipment will illuminate a surface. See for instance John William Tudor Walsh, Textbook of Illuminating Engineering (Intermediate Grade), I. Pitman, 1947. The earliest confirmed use of the modern meaning was in a post on the Usenet group net.astro dated 14 March 1986 net.astro – Spring Equilux Approaches, which refers to "discussion last year exploring the reasons why equilux and equinox are not coincident". Use of this particular pseudo-latin protologism can only be traced to an extremely small (less than six) number of predominently US American people in such online media for the next 20 years until its broader adoption as a neologism (c. 2006), and then its subsequent use by more mainstream organisations (c. 2012) The Equinox and Solstice, UK Meteorological Office. ^ a b "Equinoxes". Astronomical Information Center. United States Naval Observatory. Retrieved 26 March 2019. ^ a b Yallow, B. D.; Hohenkerk, C. Y.; Bell, S. A. (2013). "Astronomical Phenomena". In Urban, S.E. ; Seidelmann, P. K. Explanatory supplement to the astronomical almanac (3rd ed.). Mill Valley, CA: University Science Books. pp. 506–507. ISBN 978-1-891389-85-6. ^ "Glossary". Astronomical Almanac 2008. United States Naval Observatory. 2008. ^ "March Equinox – Equal Day and Night, Nearly". Time and Date. 2017. Retrieved 22 May 2017. ^ Michelle Skye (2007). Goddess Alive! : Inviting Celtic & Norse Goddesses Into Your Life. Llewellyn Worldwide. pp. 69–. ISBN 978-0-7387-1080-8. ^ Howard D Curtis (2013). Orbital Mechanics for Engineering Students. Butterworth-Heinemann. pp. 188–. ISBN 978-0-08-097748-5. ^ Mohinder S. Grewal; Lawrence R. Weill; Angus P. Andrews (2007). Global Positioning Systems, Inertial Navigation, and Integration. John Wiley & Sons. pp. 459–. ISBN 978-0-470-09971-1. ^ Nathaniel Bowditch; National Imagery and Mapping Agency (2002). The American practical navigator : an epitome of navigation. Paradise Cay Publications. pp. 229–. ISBN 978-0-939837-54-0. ^ Exploring the Earth. Allied Publishers. pp. 31–. ISBN 978-81-8424-408-3. ^ Paula LaRocque (2007). On Words: Insights Into How Our Words Work – And Don't. Marion Street Press. pp. 89–. ISBN 978-1-933338-20-0. ^ Notes and Queries. Oxford University Press. 1895. ^ Spherical Astronomy. Krishna Prakashan Media. pp. 233–. GGKEY:RDRHQ35FBX7. ^ Forsythe, William C; Rykiel, Edward J; Stahl, Randal S; Wu, Hsin-i; Schoolfield, Robert M (1995). "A model comparison for daylength as a function of latitude and day of year" (PDF). Ecological Modelling. 80: 87–95. doi:10.1016/0304-3800(94)00034-F.
^ Seidelman, P. Kenneth, ed. (1992). Explanatory Supplement to the Astronomical Almanac. Mill Valley, CA: University Science Books. p. 32. ISBN 0-935702-68-7. ^ "Sunrise and Sunset". 21 October 2002. Retrieved 22 September 2017. ^ Biegert, Mark (21 October 2015). "Correcting Sextant Measurements For Dip". Math Encounters (blog). Retrieved 22 September 2017. ^ Owens, Steve (20 March 2010). "Equinox, Equilux, and Twilight Times". Dark Sky Diary (blog). Retrieved 31 December 2010. ^ Hilton, James L.; McCarthy, Dennis D. (2013). "Precession, Nutation, Polar Motion, and Earth Rotation". In Urban, S.E. ; Seidelmann, P. K. Explanatory supplement to the astronomical almanac (3rd ed.). Mill Valley, CA: University Science Books. pp. 205–206. ISBN 978-1-891389-85-6. 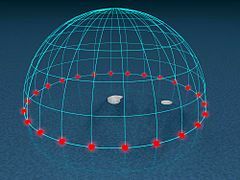 ^ "The IAU Working Group on Precession and the Ecliptic...have recommended that the ecliptic be more precisely defined as the plane perpendicular to the mean orbital angular momentum vector of the Earth-Moon barycenter passing through the Sun in the BCRS." [Internal citations omitted]. ^ United States Naval Observatory (2006). Astronomical Almanac 2008. Glossary Chapter. ^ Meeus, Jean (1997). Mathematical Astronomy Morsels. ^ Meeus, Jean (1998). Astronomical Algorithms, Second Edition. ^ Montenbruck, Oliver; Pfleger, Thomas. Astronomy on the Personal Computer. Springer-Verlag. p. 17. ISBN 0-387-57700-9. ^ J. Meeus; Mathematical Astronomical Morsels; ISBN 0-943396-51-4. ^ "Satellite Sun Interference". Intelsat. Retrieved 20 March 2019. ^ Miller, Alex (17 April 2018). "How satellites are affected by the spring and autumn equinoxes". Inside Viasat blog. Retrieved 20 March 2019. ^ "PIA11667: The Rite of Spring". Jet Propulsion Laboratory, California Institute of Technology. Retrieved 21 March 2014. ^ Lakdawalla, Emily (7 July 2016). "Oppositions, conjunctions, seasons, and ring plane crossings of the giant planets". The Planetary Society. Retrieved 31 January 2017. ^ Mars Calendar. The Planetary Society. Look up equinox in Wiktionary, the free dictionary. Wikimedia Commons has media related to Equinox. Gray, Meghan; Merrifield, Michael. "Solstice and Equinox". Sixty Symbols. Brady Haran for the University of Nottingham.